On a rare steamy September night at the Rain Nightclub in Malden MA., the band MASS took stage with a cool blast of good ole Rock n’ Roll. The forces of Mother Nature did not stop the crowd from coming out and partaking in this eventful evening. After starting a little late they grabbed the crowd and shook them until they submitted to their brand of Rock. Louis St. August, lead vocalist for the band entered with fury and pounded out some vocals that were totally surprising to say the least. Not knowing what his capabilities were I was highly impressed with his range of vocal ability. They started with “Falling From Grace” and from there they took control of the crowd with many of the bands own songs while mixing in some covers that stung with lyrical might. 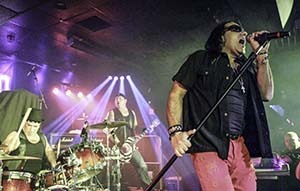 Joey “Vee” Vadala on drums slammed each song with a hardnosed attitude and soft menacing strength. His ability to mesmerize the crowd with songs like Zeppelin’s “Kashmir” and The Who’s “Reign On Me” was more than enticing and mind numbing. He also blasted out some of the bands own stuff like “Chance To Love” “Do You Love Me” and “Sea Of Black”. Guitarist Gene D’tria plowed through their set with fervor which was integrated with a hefty dose of gratifying sound. His playing was similar to a comet rifling through the atmosphere, hard and fast. He commanded his instrument with direction and musical expertise. At one point he bent over backwards and spewed water from his mouth into the air while hitting the chords with ferocity. Bassist Mike Palumbo is not to be left out, he added to the bands structure with his synchronized rumble. Not holding back by any means he accompanied the other members with his tenacious style of bass playing. Much like the others he took charge with authority and determination to engage the crowd with the bands flair. The band was also accompanied by guest keyboardist, Jeremy Heussi who makes appearances for live shows and studio work which complimented the bands performance with every chord he hit. He was an added bonus with satisfying execution which made for a pure and intoxicating night of harmonious alliance. 3 Responses to "MASS At The Rain Nightclub – MA"
MASS Rocks New England I love them this show was killer!!! I have loved these guys they tear it up. This was a good show and LA G was also rocking!